Affiliates earn a commission of 50% of the full license fee paid and referral cookies last 6 months. We will pay any commission due at the end of each calendar month via PayPal. 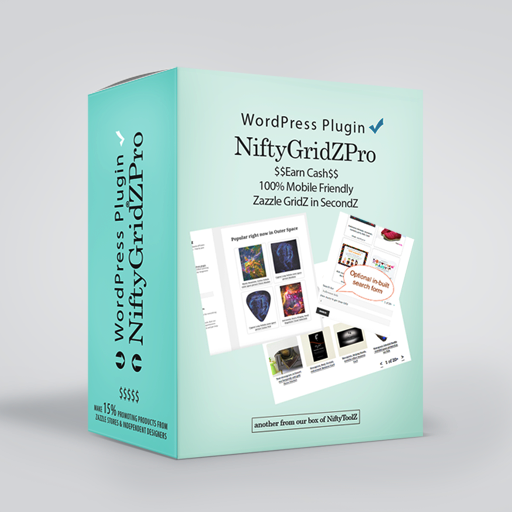 Why become an Affiliate for the NiftyGridZPro WordPress plugin for Zazzle? If you want NiftyGridZPro for yourself, become an affiliate for it first and when we get notification of your sign-up, we’ll send you your promo code for 25% off. First and foremost, pretty product grids that sell! More eyeballs means more commission – works brilliantly on both mobile and desktop! Earning extra with site-wide Google Ad injection into product grids! For banners and boilerplate sales pitch text that you make your own, visit our affiliate resources page. We use E-junkie to sell our digital downloads and offer our affiliate program. You can sell your digital downloads / clipart packs with them, too. This is our referral link for them: Digital Delivery by E-junkie. We are a UK Limited Company – Crocus Information Ltd. The license fee paid by the purchaser already includes VAT at the appropriate rate, based on their location in the UK or European Union. Outside those areas the license fee paid does not include VAT. We are registered for VAT and if you are in the UK or European Union the commssion we pay you will include VAT at the appropriate rate. If you are located in the UK or European Union and registered for VAT, we will contact you for a VAT receipt on the email address we will receive from you in due course.